Medieval Combat Sandbox. Earn Equipment. Upgrade skills. Build Castles. Siege Engines. Experience Massive Battles. Fight, Die, Learn! Join massive battles as a single soldier. Will you survive? Melee: Battlegrounds is a pre-alpha stage standalone, 100% independent game being developed as the spiritual sequel to the popular Mount & Blade Warband mod cRPG, with the intention of making the best medieval combat game available by using what was good and improving on what can be done better. The game is made upon our own homemade engine which also will allow for heavy modding - mod anything you can think of! Everything you see in the video is very much Work in Progress, especially animations which we've stressed out under Risks & Challenges. We're a team of 17 individuals, all coming from modders backgrounds, sitting online all over the world from the US to Europe to Asia, working alongside our daily jobs and lives in order to make the game of our dreams together with our community. We have teamspeak Q&As until the kickstarter ends every Sunday from 5pm to 7pm (UTC/GMT), teamspeak.melee.org learn more about teamspeak here. Meet hundreds of other players on epic medieval battlegrounds. Control your warrior in Third or First Person View, battling it out in a reaction-based combat system. Various game modes for different playstyles ensure that there's something for you: duel, round-based teambattles, castle assault, competitions and a huge sandbox where both teams build castles on the fly and conquer those to seize territory control. Medieval combat - The combat is intense, direct and personal. Every player brings their own style to the battlefield. Try to anticipate your foes’ actions – outmaneuver, outplay or outsmart them! The 360° attack/block system makes combat easy to learn, but impossible to master - there will always be something new to learn. Customize your character - There are no perfect weapons - you will have to figure out which one fits your playstyle the most. There are no predefined classes - Progress your way towards the top and pick whichever combination keeps you above ground and your foes six feet under. Upgrade your skills - Earn experience on the Battlegrounds. Unlock skills that allow you to enhance your fighting style and give you an advantage in combat. Use a clever combination of skills to strengthen your playstyle. Use Siege Engines - The other half is wrecking them again. 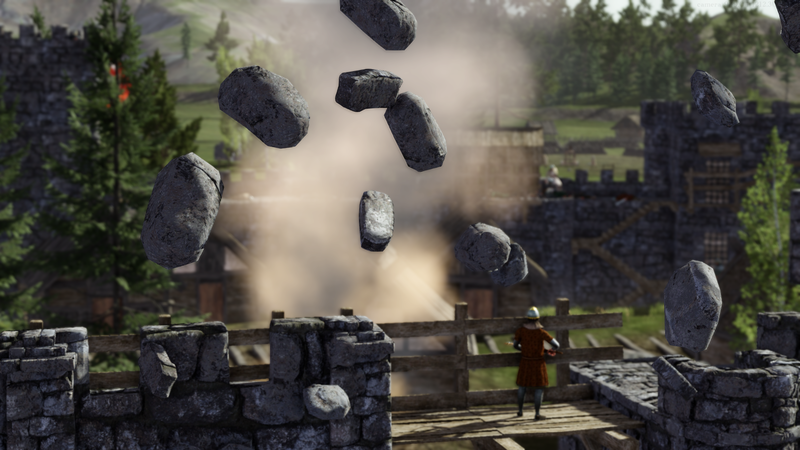 Take full control over Catapults, Trebuchets, Battering Rams, Siege Shields, Siege Towers, Ladders, Ballistas, Tunneling and a few crazy things you’ve probably never seen before. They sure were creative back then to get from point A to point B, especially with point B being walled in. Experience Massive Battles - The game can feature battles with over 200 players fighting against each other at the same time. Are you a lone wolf, or will you use the advantage of working as a team? Fight, Die, Learn - You will die – a lot. It’s part of the experience. Some might be gifted, but most will have to practice to become a renowned Warrior. The bread and butter of Melee is combat. It's our number one priority – if the combat isn't good the game isn't good, and we want the game to be awesome! First of all, physics! We've based the entire hit detection system on physics allowing for a very natural combat system where weapons can connect at any time during a swing. The combat is very intuitive – easy to comprehend, but hard to master. You control your input with your mouse: flick to the right and your attack would go to the right, flick lower left and you'd perform a move at that angle. This is true for all 360 degrees. We believe this provides a very natural and fluid feel to the combat, and gives the player unrestricted freedom of movement. Apart from that there will be many special moves to surprise your enemy – kick, nudge and shieldbash, to name a few and they all come with specific strengths and weaknesses. The learning curve for using weapons can be compared to handling rifles in a first person shooter: aiming at someone is easy, but compensating for recoil and crosshair placement on a moving target is difficult. For melee weapons, it’s the same: you can just swing randomly at the enemy, but they may swiftly outplay you like that. Use timing, surprise them, quickly change your attack angle – you need to break their defense while maintaining your own. However, being good at melee is not the only skill needed in combat; movement is key, awareness is key, and knowledge is key. When you are fighting alone against two foes, you can either let them surround you – or use one of them as cover against the other. That is just one of many examples, reading the battleground and understanding the dynamics of the situation is what keeps you alive. Also, there are more ways to fight on the battlefield than simply wielding a sword. Team work is not just a buzzword for us, it is a fundamental part of the game. No matter how good you are at fighting, you will need to work with your team to survive. We want to promote that in every fashion. You can form groups within a server which enables options for performing various commands such as formations, directed by the group leader, to enhance teamplay by creating features where two or more players can work together. What you can see in the video is our own, homemade engine. It was specifically designed and is still being optimized to do exactly what we need: large medieval battles. Due to the close proximity nature of Melee combat, we have found ways to optimize the netcode so it supports more than 200 players on one server. There will be a huge assortment of both weapons and armors available, enough to allow everyone to properly distinguish themselves on the battlefield. Look like a peasant, a knight, a commoner, or something entirely different. Looks aren’t everything. Wearing lighter armor results in faster movement but lower protection. There's always a trade-off and no perfect combination, so go for whichever you find most fun or effective in combat. A variety of different weapons will be available in the game, allowing for you to truly specialize in many different forms of fighting, from using weapons with a shield or without, there'll be hundreds of different items ranging from swords to polearms, axes, maces, hammers, spears and more. Hammers and maces are more effective against heavier armored opponents, spears have good direct piercing damage and polearms are all-round good weapons, especially against those wielding a shield. Various siege equipment will be available in different game modes. From siege towers to battering rams, catapults and trebuchets, there'll be plenty of fun to tinker with for those who desire the life of a siege engineer. A frequent question we receive “is the siege equipment pre-placed or pre-scripted?” No, none of it is. It’s up to you to decide where and how to use them most efficiently. Social activities and player interaction is in our opinion a big part of what makes a game not only more enjoyable but also adds to its longevity, that's why we've opted to make what we’ve (for now) dubbed the "Tavern Map": we intend for it to be a big medieval city where all players can spawn in and interact with each other. You'll be able to communicate freely, use emotes, trade, use the auction house or tour the market for supplies and upgrades, or set up your own little booth to sell off the spoils of the day. Land ownership will be available on the Tavern Map, from living just outside the main gates in village houses and huts to deep city apartments in the slum area or, if you should be lucky to accumulate enough wealth, one of the more prestigious properties. Fly your banner outside your home to let everyone know who the new neighbor on the block is! Make friends and invite them over to show off your latest spoils, or newest ideas for heraldry designs. Everything you can see in the video is the result of hard, hard work over the last two years. This was all achieved with a budget of 45.000$ - money that the cRPG community invested into this project in January 2013 (A big and honest Thank You for believing in us, guys)! Those funds were used to develop the engine, all models, animations, sounds, gameplay, and pretty much everything you see. Lots of stuff needs work, but the base is there – now it’s a matter of iteration and improvement. For that, we need to move to one place, get an office, and work together full time as a team. Working remotely only works for some time - at some point, you need to interact heavily and tie all ends together. We are at this point now, and need your support! The engine, being the main construction site for the last two years, is nearing the point where it supports all the features needed to complete the game. From now on, main focus will be on developing the gameplay features. The animations, being a core feature of the game, will be improved iteratively until they look as natural as possible. The asset team will be busy with creating the plethora of weapons and armors that you guys will use to smash each others helmets. We plan on releasing the alpha version in March 2015, which will have full focus on the combat. As this will be one of our strongest features, we will not stop developing this until it is at the point where we envision it to be: smooth, fun, fluent, intuitiv, rewarding, responsive. It will also feature new weapons and armors created by the asset team. The performance of the engine will be optimised: Expect higher FPS and lower latency due to changes in the renderer and the netcode. The battle gamemode will be made available by that if there is the time, otherwise this one gets postponed to the beta timeframe. The beta testing phase will begin in the last months of 2015. All alpha testers will receive constant updates until the beta phase, so you can follow our progress nicely. The skill system will be fully available by the time beta starts, as well as all the gamemodes. All planned weapons and armors will be finished by then. Here the finetuning of all skills and balancing based on your feedback starts, and fixing of the remaining bugs as well as performance issues. Now all should be ready! If at any point we think we can’t keep up with our original deadlines, we will inform you immediately. Up to the release, the asset team will create your custom skins, models and animations. The coders will fix all bug, and then you will experience the fully intended epic gameplay of the game! Badges - From a commoner to a Knight, all badges will be shown ingame and on your forum profile. Meet the team - If you’re around our future office location we would be happy meet you and say hello, show you the game development up close, just contact us and we’ll set something up. Digital copy of the game - A game key will be sent to you per email upon the retail release. If you already have an account by then it will upgrade automatically via patching. Beta access is scheduled to start around November 2015, it might be a bit later it might be a bit sooner. The beta version will be a stable proper version of the game, it will still have some issues but overall should be a great indicator of the final project. All who’ve pledged for ranks involving beta access will be contacted well in time for the start of the beta. Register your character name - As soon as the Kickstarter ends we’ll send out an email explaining how to properly secure and immortalize your name for Melee: Battlegrounds. Alpha access - You’ll get access to what we consider the earliest playable version of MBG. It’ll most likely have bugs and issues but should provide you with a good sense of the future for the game. All who’ve pledged for ranks involving alpha access will be contacted well in time for the start of the alpha, estimated for March 2015. Get access to an alternative look for one weapon - We will create an alternative skin for every weapon ingame - use it on your favorite item and show your status! Name and Engrave one weapon of your choice with your registered nick - we will add an actual texture with your name to a weapon of your choice plus rename the weapon. Instead of “Two-Handed Great Sword” it would for example be “chadz’ poker” – The looks and name can be seen by other players. The stats of the weapon will not change. Get access to an alternative look for one armor - One of your armors will have an alternative skin available for selection. The stats of the armor do not change. All Concept Art in High resolution - You’ll receive all our concept art in heavy high resolution .tif files, the size is like 5760x3600 for some. Full Original Soundtrack Download - An official OST with all the music for MBG, composed by Simon Schütt. Your title will be announced to everyone when joining the game - Your given title will be announced together with your character’s name on any servers that has announcements enabled. Register your clan name for Melee: Battlegrounds - Once the Kickstarter ends you’ll be able to reserve a clan name for M:BG. All clan name reservations will be divided by: first pledged, first served, which means those who pledge earlier will have have first right. Squire Pack - get your own squire - figuratively. Give the extra copy to a friend and train him as your companion! Or just kill him when you see him. The squire pack is meant for those who’d like a digital collectors edition plus an extra standard copy to gift to a friend. Clan Pack - The easiest and cheapest way to get 8 friends into the game together. You all receive Man-at-Arms badges plus the pack includes reserving all your nicknames and clan name in M:BG. First pledged, first served. Custom animation (Emote) - A unique custom animation for you and those you wish to share it with. Send us a reference and explain what you want and we’ll make it happen. Please note that the animation cannot be something completely immersive breaking, it should be within a medieval theme. Custom made weapon - The team will make a unique weapon just for you. It can be anything you want as long as it’s in style with the game and properly medieval themed; no light sabers, sorry! Custom made armor - As long as it’s within appropriate parameters of the game we’ll work together with you to make literally anything you suggest. Do you want a unique armor that’s simply a strapped on barrel, sure! It’s yours. Want to look like a specific famous medieval person or otherwise? We can do it! Custom horse skin - We will customize a horse a skin in accordance with your wishes, get that perfect white stallion or immitate the look of a favorite horse of yours. Fancy clan pack - The clan pack for people with style. It includes 10 digital collectors editions all with Knight badges, the ‘featured clan’ service, members of a featured clan is announced separately when joining a server plus have access to special presentation page features. You also receive 1 custom made weapon, animation, armor and horse skin. Noble clan pack - for the clan that appreciates a good accommodation! In-game statue - The ultimate immortalization. We’ll sculpt a statue in your or your character’s liking and place it in-game on either specific maps or the social map for all to behold and envy. All alternative models/skins unlocked - You'll have full access to all alternative models and skins in MBG (this does not include custom created models and skins from Kickstarter pledges). Bascinet helmet - A real life bascinet helmet, worn to many battles by Zimke, not an easy feat nor a cheap one. You’ll receive this fantastic and unique piece of medieval armor carefully packed and polished. Got to admit it’s pretty darn cool! 3D Print - Your very own uniquely 3D printed character. Pick out what you want and we’ll put it together and have it printed and shipped to you! Music is one of the best tools available to create a certain atmosphere or a feeling. We want the player to feel heroic - but in a cinematic way. The music will lift up the action of the game into something that feels both more real and more cinematic/epic at the same time. Every random siege or tournament can be something that stays with you for a long time as the music helps craft a narrative for the chaos of battle, making those events into stories you remember well. The OST is based on “the Lay of Hildebrand”, a 9th century text telling the struggle of an old warrior in a changed world, something we feel fits perfectly with the world of Melee: Battlegrounds. It will be loud, it will be quiet, melodic, beautiful, ugly, brutal and gentle - the perfect accompaniment to the game itself. The music is composed and produced by Simon Schütt. All sound is recorded on locations ranging from ambiance in the Norwegian mountains to visiting medieval reenactment events. We want the sound to immerse you as well, to hear what kind of armor you’re wearing when it’s raining, if it’s linen, leather or mail. For weapons and armors our resident sound wizard Glenn Goa has a large collection of medieval weapons, so when you hear the sounds of a longsword they’re actually recorded from an actual real life longsword. Not just the weapons have had their sounds recorded from real life counterparts but the siege engines too has been recorded from actual real life built siege machines, on location (movie props, but they’re movable). We come from modders' backgrounds. For us moddability is not just something nice to have, it’s something we fully embrace. That’s why we intend on working very closely with the modding community and making sure as little as possible is hardcoded in our engine. The SDK is based on the C# Language (implemented via Mono) and super easy to code with. All game mode related code will be released to the modding community which means you can either adapt, tweak, or change our code or do the whole thing from scratch. If you should run into any limits with the engine, talk to us, we’ll listen and do whatever is possible within our means. We know how tedious it can be having to work around small simple problems by applying huge hacks, so we’ve designed the engine to be as easy to modify as possible without making you code the basics from scratch. Want to code the killer bunny from Monty Python? No problem! A dual-axe wielding laser shooting viking on jetpacks? Easy! A full blown strategy game, a dragon riding game, a medieval farming simulator, a physics based golf game, a mage duel competition, literally anything you can think of, you can mod it. We plan to release the SDK for everyone together with the alpha release. We're the team behind the "cRPG" Mod, a Multiplayer Modification for Mount& & Blade Warband. chadz started working on it in 2010, and then more and more players joined him in developing the mod. For the last four years we have taken care of the mod and I think it’s fair to say we not only took care of the community, but that we are a part of it. Now we're 17 people working on the game and while we might not be famous we certainly have the will, dedication and spirit to achieve something we all know requires sacrifice. We've been truly giving it everything in the last two years, working whenever we've been able to outside jobs. Some even made the ultimate sacrifice of moving back in with their parents to save additional funds! For us, this is not just a project, this is the dream game we want to play ourselves. We do not tunnel our communication through a PR filter! Everyone of us speaks his or her mind when we feel like it, each of us has our own personality. $ 150.000 – “More than Ramen” - yes, we can do it with the original goal and that's all we can dream for! - but it would be nice to eat something other than ramen for a year. :) As a symbolic thank you for all the healthy meals you are sponsoring us, Zimke, who is actually a certified medieval chef (that is a real thing! ), will cook us something healthy and medieval, and we’ll record the tastyness for you on video, and Zimke will also write a short medieval cooking guide that every backer will receive via PDF! TBA ... “Official Ladders, Leagues, Tournaments” - Duel your way up a competition ladder or battle against other clans in various tournaments: ranging from one on one melee combat to jousting and more. We will provide you a fancy complete package that combines both a website and ingame features together for your convenience. You’ll be able to challenge other participants for a chance to show the world your abilities. All results are immediately recorded, and matches can be replayed and rewatched. TBA ... “A singleplayer and co-op campaign!” Command huge armies while being one of them! You control a faction of medieval Europe, conquering neighbor after neighbor, enemy after enemy - either alone, with, or against friends. Be a strategist on the map, and a tactician on the battlefield. Level your generals, and decide the composition of your armies. You can and have to use the entire range of siege equipment to bring down enemy castles. Build your own castle and prepare it for the invasion of your foes. Did you take all weak spots in your plan into consideration? The biggest challenge we are facing is to get the animations right. The animations you can see now are what we consider roughly 50% of the quality that we are aiming for - for that, we need to iterate them over and over again. The difference to, for example, a first-person shooter is that the animations matter a lot more. Not only do they define where and how you get hit, they also define how far your swings are, how fast etc. The quality of the animations makes or breaks the game, which is why a large focus will be directed towards that. A small yet existent risk is unforeseen incidents. The planned budget has a 15% "safety buffer" included, so we are capable of dealing with minor unforeseen problems. However, the content of the game would have to be cut if something major would happen, eg injury of a team member, or anything that requires a large payment to a non-developing related issue. Serf Badge + Meet The Team + "I backed M:BG and all I got was this lousy screenshot" - We are not sitting in an ivory tower; when you are nearby the office say hello, let us show you what you made possible! --- Also, we made hundreds of screenshots during development. Get a random screenshot out of the full album - some are silly, some are boring, some are funny, some are lousy. Share them with other players - can you collect them all? Peasant Badge + Digital Copy of the Game + Meet The Team + Random Screenshot - our plan is to release the game by March 2016 - and you get your digital copy on day one! Commoner Badge + Beta Access + Digital Copy of the Game + Meet The Team + Random Screenshot - If you want to get your hands on the game earlier, this is your reward. We will enter Beta Testing by November 2015. Militia Badge + Alpha Access + Register Nick + Digital Copy of the Game + Meet The Team + Random Screenshot - If you want to experience the game as early as possible, you will want the alpha access. Alpha will begin in March and have a complete combat system. Two "Full Packs" á 45$ (Both come with the Man at Arms Badge). Give it to an enemy, give it to a friend, give it to a stranger, your call! Digital Collectors Edition: Full Pack + Sergeant Badge + All Concept Art in High Resolution + Full Original Soundtrack Download + Engrave 3 Weapons + Alternative Look for 3 Weapons + Alternative Look for 3 Armors + Your title will be announced to everyone when joining the game + Register your clan name. Clan names are "First pledged, first served"
Clan Pack - 8 "Full Packs" á 45$ + Register your clan name. Clan names are "First pledged, first served"
One Custom Animation + Private Property Ownership + One complete Digital Collectors Edition (with a Knights Retinue Badge) + One Full Pack (with a Man at Arms Badge) - we will make you a custom emotion animation, based on a reference video/picture you provide. only you can use it, unless you give other people permissions to use it (eg clanmates). (Must fit the game)! A complete Digital Collectors Edition (with a Knights Pennantier Badge) + One Full Pack (with a Man at Arms Badge) + a custom animation + private property ownership + a custom made weapon - we will make you a custom weapon, based on a reference you provide. Only you can use it, unless you give other people permissions to use it (eg clanmates). (Must fit the game, time period, will use the same stats as an already existing weapon)! Noble Clan Pack: 10 Digital Collectors Edition (all with a Knights Badge) + one custom animation + one custom made weapon + one custom made armor + one custom horse skin + one "featured clan" Registration - Members of Featured clans will be announced ingame separately when joining a game + special presentation page features + 10 private property ownerships + 1 clan hall property ownership - have a clan house where you can meet and celebrate your triumphs. Different rooms for public and private meetings. Noble Clan Pack + we will model a statue that you want (of yourself, or something different) and put it ingame as a statue. Noble Clan Pack + all alternative models for all weapons, armors and horses unlocked (not the custom created ones) + we will send you Zimke's real Bascinet Helmet + we will 3d print your character and send it to you + King Badge!